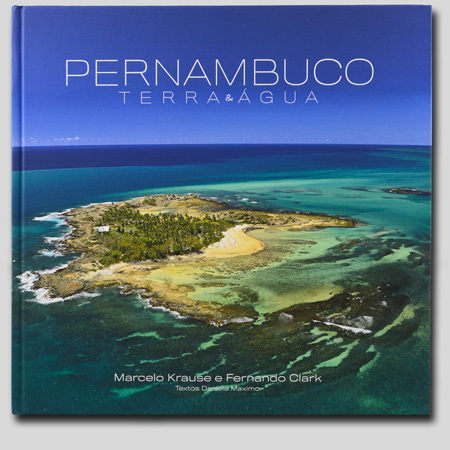 It was the passion for photography that united the paths of Marcelo Krause and Fernando Clark in the work of unveiling the state of Pernambuco under and over the waters, registering the most beautiful landscapes, from the Coast to the Sertão, either on the ground or under the sea. The result of this work is compiled in the book "Pernambuco Terra e Água”. Marcelo Krause visited Pernambuco for two years on several occasions, making clicks of the Carnival, the Cowboy Mass and the Passion of Christ of New Jerusalem, as well as the historical points of Recife and Olinda, Many other landscapes from the Zona da Mata to the Sertão, including the São Francisco River and the city of Petrolina. Fernando Clark brings the interaction with the divers and the marine environment in his photos. He portrayed countless sea creatures and the state's historic wrecks, ranging from second war corvettes to steamships. Clarck was able to record in Pernambuco the largest fish in the oceans: the whale shark, which is rarely seen there. The texts and research are work of the journalist Daniela Maximo who, like Clark, is passionate about marine waters. She began diving in 1997, becoming an instructor at Scuba Schools International (SSI) in 2008. For five years she has been director of the largest magazine in Latin American specialized in diving. J. Borges, a local artist, makes a special participation in the book with three woodcuts specially made for the project.